When it comes to hosting holiday parties, I always start my menu with a cheese plate. 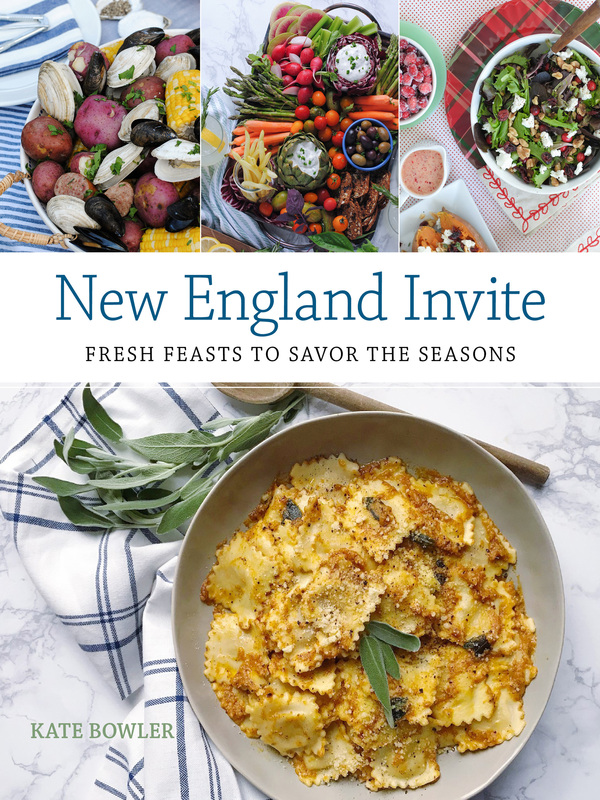 Dinner parties, cocktail parties and open houses – you better believe there will be cheese at all of them! 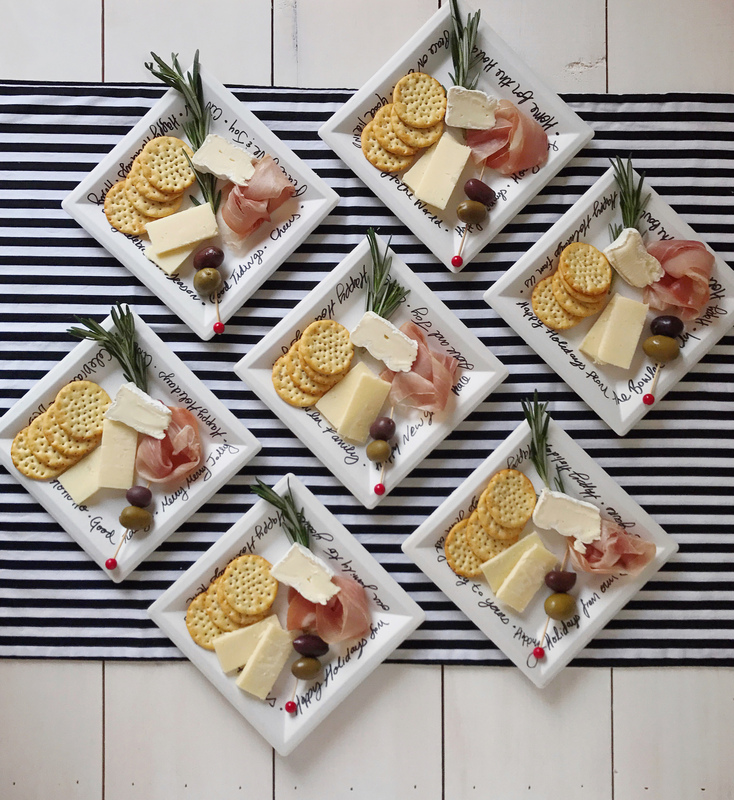 This year for holiday entertaining, I thought it would be fun to take a different approach to the cheese plate and try a brand new way to serve my favorite cheese board components. Instead of bringing out a big marble board for a heaping cheese plate to serve before a meal I decided to break down all of the ingredients into single portions on individual plates. 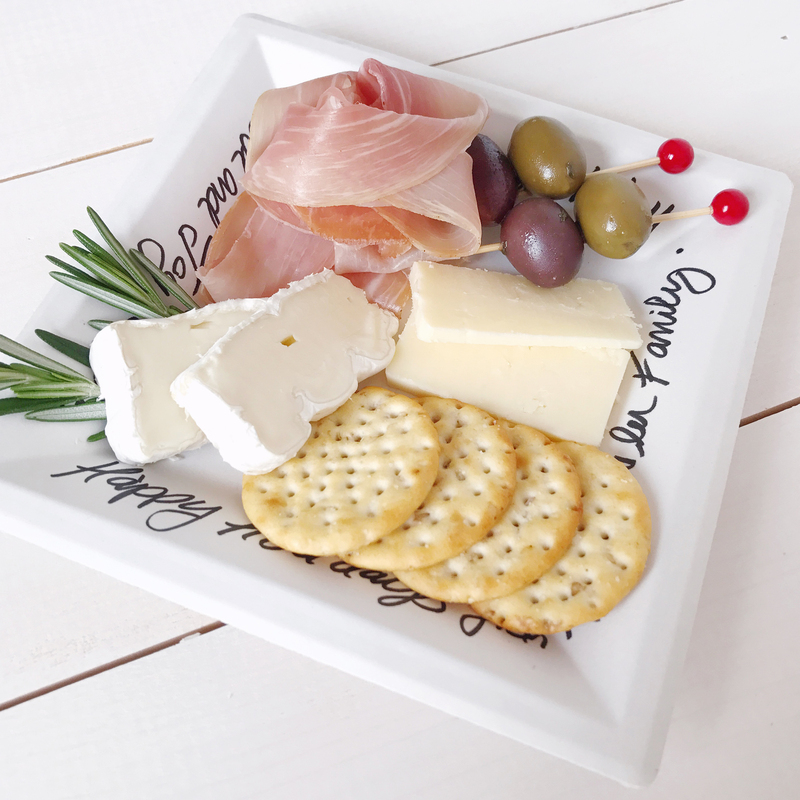 To start, I took Chinet® Classic White™ square dessert plates – they’re the perfect size – and gave them a little bit of extra flair with some decorative writing around the edges. 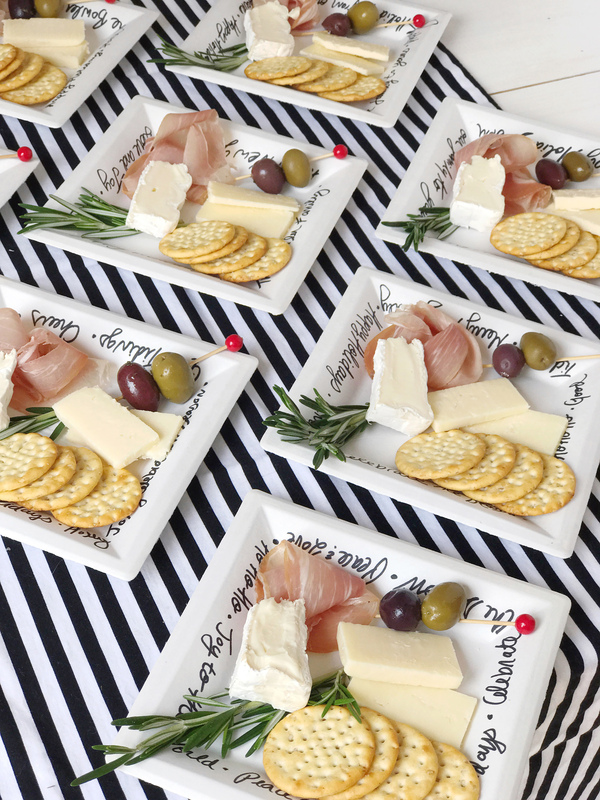 A permanent marker, in any color to match your décor, and some quick cursive writing is all that it took to make these plates look extra special. 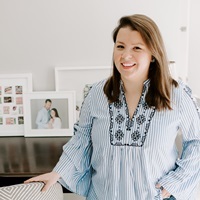 You can write holiday messages like “Happy Holidays from Our Family to Yours,” holiday carol lyrics, or even the names of your guests to use these as place cards for a sit-down dinner. 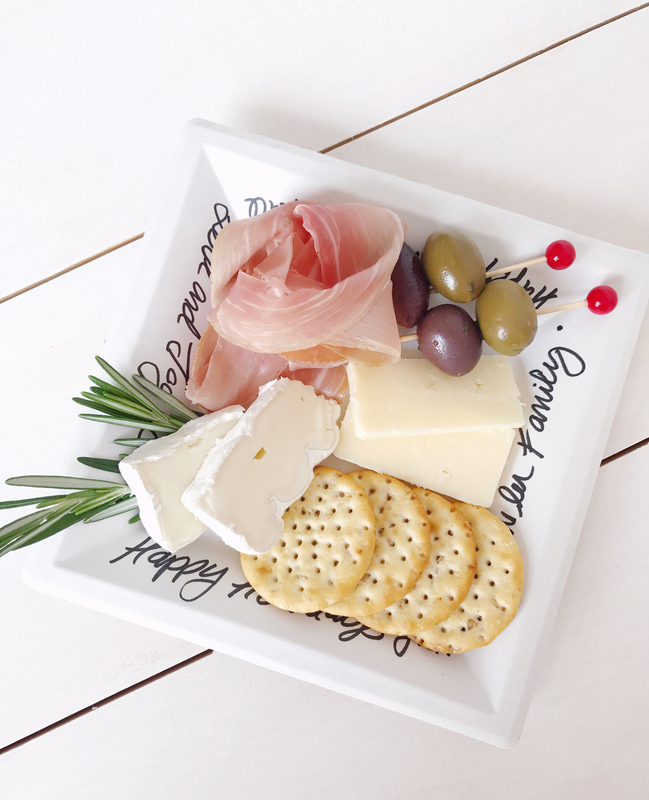 Next I built out the individual cheese boards on my decorated Chinet Classic White plates with a piece of prosciutto, a festive spear of marinated olives (holiday toothpicks are fun touch! ), a few slices of mixed cheeses, crunchy crackers to pair with the other bites and a sprig of rosemary for a seasonal garnish. When presented together on the table they make a huge impact and actually cut down on the total amount I had budgeted for the ingredients. The individual portions make sure everyone gets the perfect plate, without a ton of extra food waste (I hate throwing away uneaten cheese at the end of the night, it’s so sad!). And don’t worry about clean up, you can stack up the plates and pop them in the recycling bin! 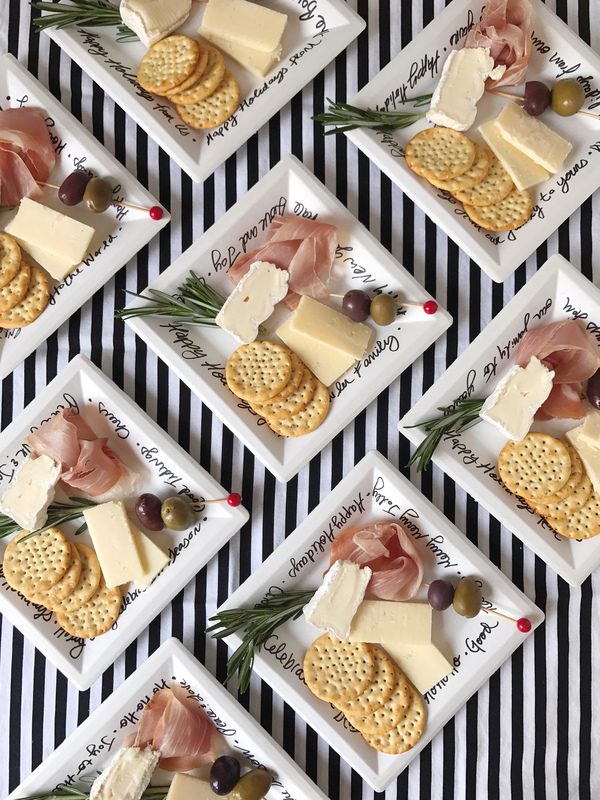 The customization of the plates, paired with some simple black and white table linens and fresh herbs makes this idea perfect for transitioning across parties all holiday season – from Thanksgiving through the New Year – because it’s not a party without a cheese plate! Please note: This post was created in partnership with the Chinet® brand. All opinions, ideas, and images are my own. Thank you for supporting brands that support this site! Fall Entertaining Inspiration. Grapefruit Sage Sparkling Mimosas. 4 Responses to "Mini Holiday Cheese Plates." This is such a great idea, Kate! I hate nothing more than throwing away cheese haha! Also love how you customized the plates too! Throwing out cheese is my actual nightmare, haha! Love this idea too, Kate! Really different for a hosted party and makes sense!